It’s officially fall, folks, and I love getting in the kitchen and whipping up some hearty, soul-warming soups! 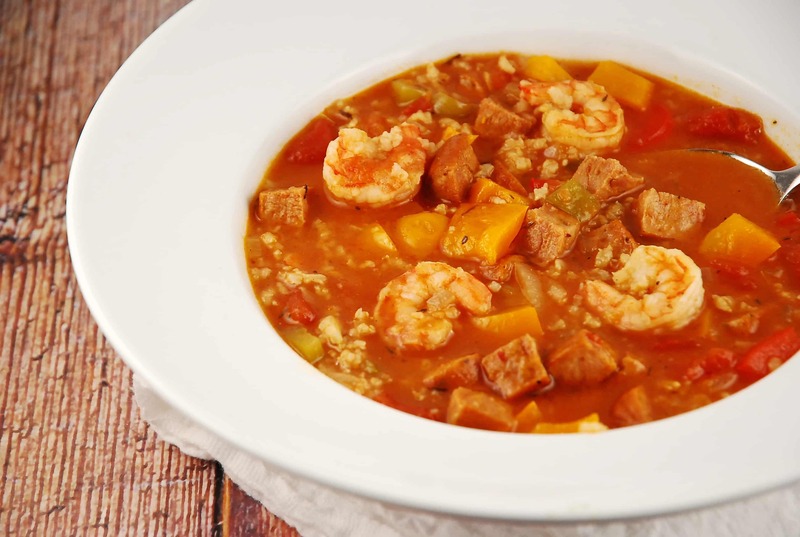 My husband’s personal favorite is this Healthy Jambalaya Recipe. It is packed with 3 tasty proteins – chicken, shrimp, and sausage. You can choose to make this a tad lighter by subbing out the andouille sausage with some light turkey or chicken sausage, but I’m such a fan of the spicy and flavorful andouille, I’m willing to sacrifice a Point or two for that fantastic flavor. Each ample serving is certain to fill your stomach and and your soul, at just 8 Points. The easy to follow recipe will have you wanting to make this jambalaya again and again. Enjoy! Hearty, savory, and soul-satisfyingly delicious, this jambalaya is sure to be a family favorite. Loaded with nutrition and bursting flavor, you will love this healthy dish! Heat oil over medium high heat in a large pot or Dutch oven. Add in onions, peppers, celery, and garlic. Sauté until tender, about 3 minutes. Add in sausage and chicken, and heat until meat is cooked through, about 3-5 minutes. Now stir in all the remaining ingredients, except for the shrimp. Mix well. Lower heat to medium, cover and let simmer for about 45 minutes, or until rice is soft. Adjust seasonings as desired. Add in shrimp, and continue to simmer until shrimp are pink and cooked through. Serve hot.